Zabatt is the Master Distributor for Kobelco KNW Series, oil-free rotary screw compressors ranging from from 20-500 HP. 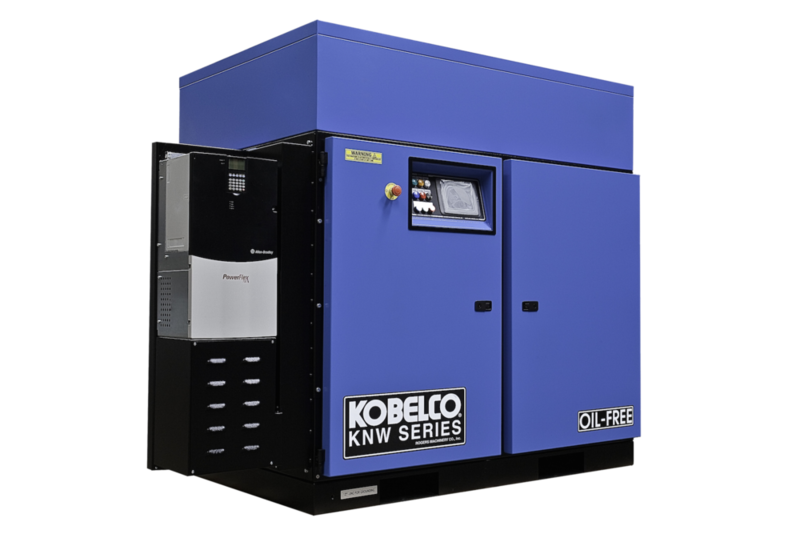 The Kobleco compressor is designed, manufactured and assembled and tested in the United States The compressors are known for their long-life, minimal maintenance, and low operating cost. The two-stage oil-free rotary screw compressor provides completely oil-free air because no oil is allowed in the compression chambers. Both compression stages employ a new patented Super Rotor design, is acknowledged to provide the lowest power consumption per cubic foot of compressed air. Oil-Flooded rotary screw manufacturers will educate their customer's that oil-free air can be achieved with the right filtration. Almost all the oil can be removed with filtration but there can be no guarantee to have 100% oil-free air. In order to maintain oil-free air with filtration, the routine maintenance for the compressor and filter element changes done based on the recommended time intervals. Any deviation will affect the quality of the air. Oil-free compressors are the only way to guarantee 100% oil-free air. Power Cost Using filtration will require the compressor to operate at a higher pressure to offset the pressure loss across the filters. Moreover, a high operating pressure will increase the energy output of the air compressors. Maintenance CostOil-free rotary screw compressors maintenance costs are significantly less because there are less consumable parts, minimal lubricant, fewer service intervals and no inline filter element replacements. Oil-Flooded rotary screw compressors service intervals are every 2000 hours versus 8,000 hours on an oil-free compressor. In addition, filter elements are usually changed every 1000-2000 hours. All KNW Series oil-free compressors are designed, manufactured, assembled and tested in the USA by Kobleco Compressors of American and Rogers Machinery Company. USA sourced, non-proprietary components. Airend Kobelco's new patented super Rotor profile is the most efficient in the industry. The machined forged steel rotor sets have the ost price tolerances in the industry. FDA approved rotor coating further increases volumetric efficiency for the life of the machine. Each shaft seal consists of floating stainless steel rings and an oil labyrinth inserted between the rotor chamber and the bearings. Each seal is buffered by gas from the compression chamber which is purged to atmosphere ensuring that no lubricating oil or its vapor can enter the compression chamber. Complete status indication is displayed continuously during operation, while in stand-by or after emergency shutdown. Ethernet option is available for internet and intranet connections. Two year warranty on air-ends, three year extension available and one year bumper-to bumper. $10 million inventory to support national distribution network.